I know a mama… who’s desperately praying over a hospital bed today, where her fragile boy lays working hard to mend his severely broken heart. Yesterday marked surgery number nine in his three short years. While he’s battled courageously time and time again, there is a lifetime of mountains still yet to climb. I know a wife… brokenhearted and discouraged after praying for her husband’s salvation all these years. Hearts have grown harder than ever. Heaven seems silent. Hope is hard to hold onto. The load feels much too heavy to carry on her own. I know a friend… caught in the waiting, feeling the weight of passions unfulfilled, fighting to not feel forgotten and betrayed by what God has promised (while the rest of the world seems to be moving forward just fine). Every day is another battle to rise up and dig in as she searches for healing and hope for her future. I know a woman… whose aging body is worn and weary from years and disease. Things once taken for granted – like mobility and independent living – are no longer possible. Life often feels limited and lonely. Her mind struggles to find contentment in a body that is failing. She questions His promises and her purpose in the days that remain. 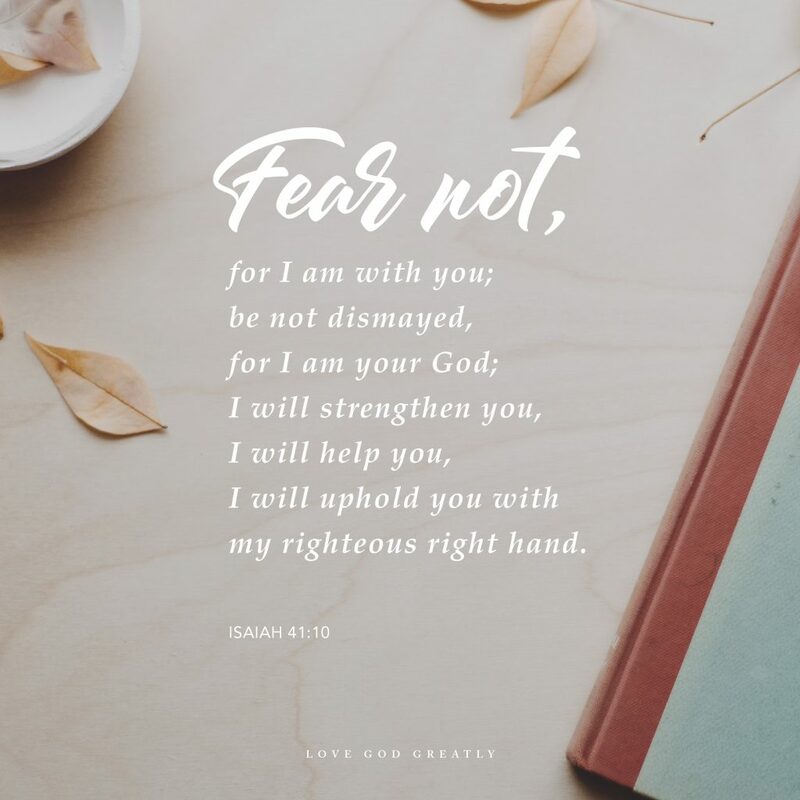 Fear not, God says… with a compassionate and loving command. He’s with us. And yet the storms of this life relentlessly challenge our soul’s allegiance to believe what is true. I believe, Jesus. Help me in my unbelief. To flee from fear, we must rehearse what is true. 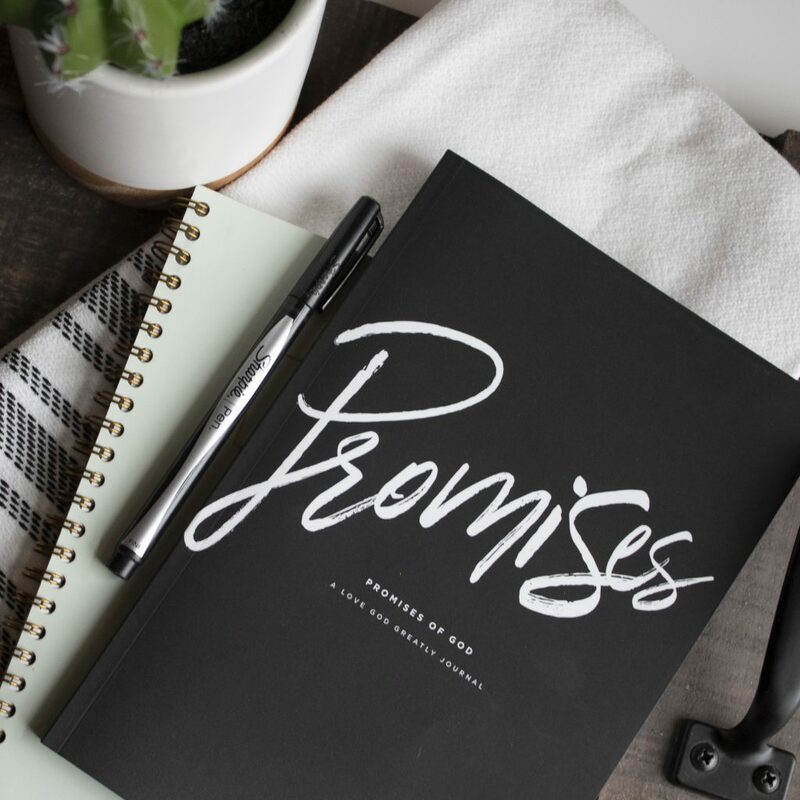 The whole counsel of God’s Word backs His promises – of this you can be sure. 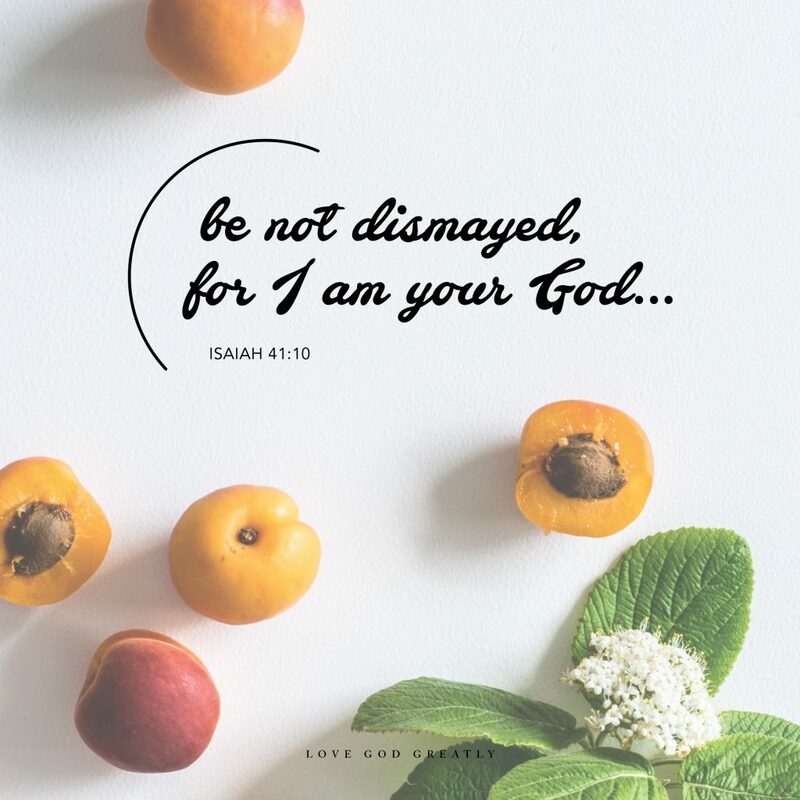 Just look at the verses leading up to Isaiah 41:10. God is with you. You don’t have to fear. Why? He was Abraham’s God and He is your God (check out the second half of Galatians 3). His character is faithfulness – that’s just who He is (Psalm 89:8). He has been with you from the beginning (Psalm 139). He has rescued you and strengthened you in the past (1 Corinthians 1:9). He’ll do it again (Psalm 23:6). He is the beginning and the end (Revelation 22:13). He never changes (Numbers 23:19). His faithfulness endures to all generations (Psalm 119:90). Girl, God is with you and that’s a promise. He’s got this too. *Let’s talk: We’re SO glad you’re joining us for our Promises of God study! Please take a moment to introduce yourself in the comments! 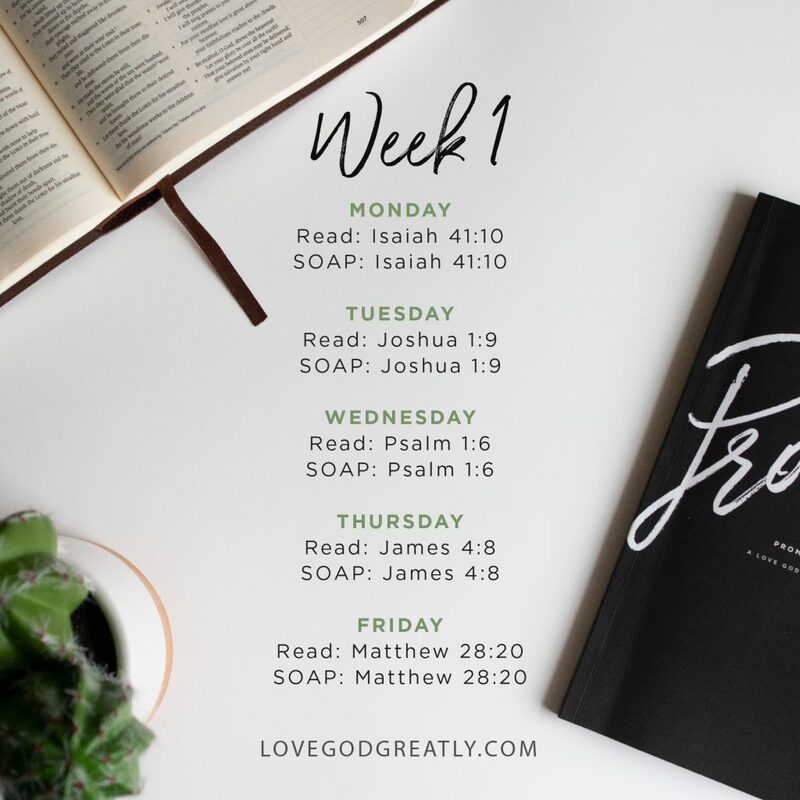 Week 1 Challenge: Every day this week read Isaiah chapters 40 & 41, then take time to write down five specific examples of God’s faithfulness in your life. As you rehearse God’s power and remember His faithfulness, respond to Him with thanksgiving and praise for who He is and what He has done! I had my notifications turned off but for some reason my LGG app popped up with the notice and it was perfect timing! Amy, we are so glad to have you here with us on the blog today. I’m so thankful too for that LGG app and for perfect timing! God bless you. My name is Celena and I am excited to start this Bible study. I have been dealing with some fear and this bible study came right on time. I cant wait to see how God turns my life around. Celena, thanks for sharing with us on the blog today. Praying for God to replace that fear in your life, and isn’t is amazing how things happen in just the right time. So glad you are doing study with us. God bless you. My name is Laurie. I am looking forward to doing the study. I popped up on my phone today at just the right time. God is good!! Laurie, So glad you are here with us for this study. I am really looking forward to it too. And we are so thankful for God’s timing! Yes He is so good! God bless you. My name is Laurie. I am looking forward to doing the study. It popped up on my phone today at just the right time. God is good!! Hi. I’m Courtney. I’m a new Christian so am new to these studies. I am looking forward to seeing what God has in stall for us all as this study is also beneficial to my current situation. Good morning Sheri thanks for being with us this morning! I bet it is cold there! I am in the desert in southern California and it is pretty chilly here this morning! God bless you and you have a great week too. Happy Monday! Looking forward to this bible study; it will be my first one. God has boldly moved through my life in the past couple of years and also within my family. Being renewed and filled by his love and grace has been the most amazing experience. All the praise to him. Amen! Ashley, thank you for sharing with us! Amen!! We are so glad to have you with us. Praise God for you finding out about thid study. We have all been praying for open hearts and minds for each person doing this study, and look forward to what God has in store for each of us. God bless you and thanks again for being with us. Hi there, Im Dawn. I was awake early this morning, struggling with back pain and my app binged with this notification…God was talking to me! 😉 Im excited to start this study as Ive felt alone and fearful for some time now in my struggles as a single mom and woman. Hoping this will help shed some light in the darkness. Hello dear. It’s lovely having you here with us. God is healing you from your pain in Jesus name. Enjoy the study. What timing. I guess I’ve been facing some fear brought on by others, causing me to have self doubt. Every time I go to work for someone they tell me I’m not good enough. They’re ugly, Christian women. The last lady, claiming to be a Christian woman, but no evidence of fruit of the Spirit, was nothing but degrading, accusing me of doing things others have done wrong. I have a fear of working for others. I can’t wait to hear about the comfort and assurance I am more than this. Dear Patricia am sorry about what you have to go through in the hands of people. but be rested assured God got you. You are loved by Him and He is always here to help you. He will never leave you nor forsake you. He can be trusted always. Love you much dear. Dear Lord wrap your loving arms around your daughter, bring godly people across her path that would love her just the way she should be. Amen. Blessed morning women of God! This has been a really trying past few weeks for me. Dealing with death and burial just Saturday October 13th, discovered major betrayal on Sunday October 14th. I was reading my bible but struggling to have faith in what I was reading. I was praying Lord help me and crying, then all of a sudden this notification popped up. I know it is God at work because all of my notifications are turned off but this came through just this morning. Praise Him, He is so faithful. I am Pat from western Tennessee. Welcome dear Pat. Great to have you hear. God bless you. Hi i am Nini from Pretoria South Africa. Hi Nini! Great having you here. God bless you. I hope you enjoy the study. Im awake, nursing my baby boy, in New Mexico. Its been a really long night so far, so I grabbed my phone to keep my eyes open (Im. So. Tired) and saw the notification for this study! Excited! Good Morning, Sisters ! Kirstie here from Michigan. I saw the notification for the new Bible study and said out loud, huh I dont remember setting up a notice for this app. I had no idea the study started today. I do remember reading that one was coming soon. Well, I will bless the Lord He knows what I need. Today in Whitney’s post to eliminate fear we must rehearse the power of God really stood out to me. I need to be reminded of this.I look forward to discovering more in this study. We looking g forward to enjoy the study with you. Our God is great. Enjoy the study darling. Much love. Looking forward to spending the next week’s in community with other women of faith! Dear Rhonda we look forward to it too. I do hope you enjoy the study. Blessings. Hi!! I am Debbie from Germany! I am so excited to begin to study the word again with that great LGG Material! Thank you all and be blessed! Hello dear Debbie. LGG was just in Germany. Welcome to another study. We do hope God bless you. Amen. God will answer your prayer darling. Just be fiathful to His word and watch Him do wonders. Much love. Looking forward to taking part in this time with God and prayers of others. Welcome Jackie. God bless you as you study His word. Amen. My name is Janniffer and my app notifications I thought was turned off and this series popped up. Im thankful because this season…campaigning locally with my husband has been emotionally tough. So many evil people but what an opportunity for Satan to shoot his arrows of doubt and fear. Im excited for this study. Hello, I’m My. This notification popped up on my phone unexpectedly and I’m excited to start the study. I’ve had trouble with a great deal of anxiety so, like many others, this notification came at the perfect time! WE thank God for notifications popping up. Our God is indeed wonderful. I do hope you enjoy the study. Much love. Hi everyone, I’m excited to take this journey with you. Wow what an awesome day 1. I thought this was just going to be a filler until my next women’s study started but wow, God has used day 1 to let me see something in me. I’m an empty-nester trying to find my way and purpose. I have been struggling with my health and getting older, not able to do some things i use to do with no problems. God reminded me I am not alone and i don’t need to fear, be anxious…dismayed because He is the God of I will…you fill in the blank! I’ve seen his I will over and over in my life, I forgot to let him have it all, even the small cares. He cares about it ALL. I will not fear because He will strengthen, help and uphold me! Thank you Papa! I’m so grateful for you in my life. He cares about it all dear. May God heal your body and make you string to be able to do all you want to do in Jesus name amen. Enjoy the study darling. Hello ladies, Im Pattie and Gods timing is always perfect! Im so looking forward to this study. Rehearsal is an idea Ive not thought about and I am struggling in many areas. May God meet you at the places of your struggles and bring you help in Jesus name amen. It’s lovely to have you studying with us. Enjoy the Study. Dear Lord,look at your daughter and please meet her at the point of her need. You alone knows her heart and you know what she needs and where she needs it. Healing is he bread of your children, so please heal her of everything. May Sue experience your peace, love and joy everywhere in her life in Jesus name amen. I am Staci from Kansas. I have been looking forward to this study. I am trying to spend more time in the word everyday and have enjoyed the studies done in the past. Hello Staci! We are delighted you are hear and so glad to hear that you want to spend more. Time in his word. May God honor your wishes and help you all the way. God bless you. Amen. I’m needing some changes to happen within myself. Last night I felt as if they were hopeless, which is true, because I need the help of the Lord. There is no quick fix for what is ahead of me. This gives me hope. Thank you for sharing. Dear Lord, please send your daughter help from Zion. You are the only one that can help us, he help of man is vain. Look at her life remember her please. Meet her at the point of her need. May your word always be in her heart in Jesus name amen. Hi, LGG, Carol from Arizona! Looking forward to another blessed Bible Study with you ladies. Honestly, I usually don’t read these posts but for some reason, I decided to open the email and read the study. I’m so glad I did! I’m in! Awwww we are glad you read and that you are in. I know you’d enjoy the study. God bless you dear. Dear Lord please keep your daughter in your word daily. May she feel your presence as she studies in Jesus name amen. Hello ladies!! I really needed this amazing study today!! Looking forward to learning about God’s promises, praying for your needs or standing in agreement with you. God bless each woman in this study. And God bless you too darling. Enjoy the study. Hi everyone. I really needed this study today. My family feels like its been in shambles, going on years and years now. Addiction and mental illness… My mom is taking all the weight as I live further from everyone while I feel exhausted from weight of it, I worry for my mom. She finds her strength in God, but I could use any prayers I can get for my brother and dad to look to God for help in this battle. Dear Lord, please look upon this family with mercy and remember them. Show them your mercy and healing. But Your stripes they are healed in Jesus name. Amen. Very timely! I’m so glad I got the notification on my phone for this study even though I had all my notifications turned off! Thank you LGG for all the work and dedication you put into these studies and making them available in different languages. May God continue use you all and increase your ministry. The devotions coupled with God’s word have been a lifeline for me and for many others I’m sure! We are glad God uses us to bless you. Most importantly we are grateful for His word. Do enjoy the study and may God meet you all the way. Blessings. Hi everyone! My name is Laura and I am so excited to start this study. Things have been really difficult in my life lately as I have an adopted daughter, 10, who is struggling with mental illness. It is so hard to see my baby girl struggle so young. My sister invited me to this study and low and behold the first day is “Don’t Be Afraid, God is with You”. I needed to hear those words more than ever. I have felt very alone lately, though I have friends and family praying for me daily. I have been afraid of what the future holds for us as a family and for her individually. I just needed to be reminded that He is near. Dear Laura, the Lord is with you. He is in control of your life. Just keep strong in Him and believe His word. He never fails. Much love darling. Right now at this moment I truly needed this an am looking foward to see how God has already delivered me! Hi, I’m Amanda from Dallas, Texas, and I’m joining y’all for the first. I came across this study thanks to a woman I have only met online through my direct sales company, and with the season that I’m in presently, I do feel as though it’s a study that I need, so I know it’s not accidental that I came across this opportunity. I look forward to reading and drawing closer to the God I know is still near me, even through the tough times. I am so excited to start this study. I’m 41 married for 22 years and we have two children, our son is 20 and our daughter is 18. I love Bible study and find new things every time I read even though I have read through the Bible many times. It’s wonderful how God brings our notice to something right on time. Hello Kathy. It’s beautifulto read your comment. Am sure your family is blessed to have you. God’s word is just new Everytime we read it. Am glad you are here with us. Enjoy the study. I am Kimberly, so blessed as I review my life and how God has been there through it all. Holding onto the truth, God’s truth, makes life much better. I am so excited for this study!! I have done other Love God Greatly studies already, but this one sounds encouraging to me. I am joining today from Nova Scotia, Canada. Hi! I am Michele from El Paso, TX. This study came at the perfect time! I am at a place in my life that I need to be reminded of Gods promises. To remember all He has brought me through and stand in the midst of opposition, as I see more of His promises fulfilled in my families life. We serve an amazing God!! Looking forward to diving into this study. Fear is something I battle with a lot so what a great verse to start this week off. God loves us and wants to bless us and He will help us stand strong in the face of fear. I dont know how this showed up/i have never heard of this mission group! But the timing is surely His! Just when I needed this! It’s like it was an email from God Himself! Thank you thank you!! My sister in law invited me! Thought this was a great idea. Hello, Im Shona from Dallas, Texas. Im excited to dive into the promises of God with you. Hello everyone. Im Rudo from Zimbabwe__recently downloaded the app to improve my relationship with God – Ive had a longing for a better relationship with Him since my mum passed away earlier this month. I downloaded this app to help me connect more with God. Im looking forward to being a part of as many studies as i can. Hello Im christi. Im new to the app and Im excited to see what God has for me. So much has happened in this year and I have felt his presence from day one. Looking forward to what he has for me and my family. Its just hard to wait in him at times. Lol Im sure you all know that. Hi! My name is Lauri. This will be my second LGG study. I just finished Names of God on my own so I am excited to get in on this one as a group. Hi everyone, I am new to bible study and at the start we are asked to write 3 goals. Can someone give me some ideas of what kind of goals these should be? I a little stuck! Thank you! One of my goals was as simply completing the Bible study and to do all 4 steps of the S.O.A.P. Study method. My last bible study I struggled with the application part. Hello ladies! My name is Ashley and I am just now joining this study. I was lying in bed this morning and felt the presence of God telling me to grab my Bible and be closer to him. I haven’t been very involved with my faith lately and I hope this new journey and the inspirations of everyone joining this study will help renew my soul and spiritual strength in the Lord Our God! My name is Lacee and I love the lord but I realized Im not in love with him. And I think thats why Im struggling so much with my singlesness. So Im hoping the promises of God will help me to understand him better. I live in Colorado. Im glad to be able to do this study. God is sooo good. When I pray gor more studies He shows up. I was so blessed to find this Bible study. I am serving as a missionary in Russia. This Saturday, I am starting this Bible study with about 20 Russian women, hungry to hear about the promises of God for their lives. Thank-you for your faithfulness in providing this soul searching material for women, it is a huge blessing to many around the world. Hello, my name is Vernita, I am happy to be here. My name is Barbara. I live in an Oxford House (which is a sober living house for people in recovery). One of my 6 housemates asked me if we could do a bible study together in our home as a family. I had no idea where to start but my sponsor suggested searching for a womens bible study guide online. I prayed to be led in the right direction and we found this website. Were excited to begin this journey! Thank you all for being here.